Are you named after someone or something? My name is Anand Nataraj and I’m named after Lord Nataraj(Lord of Dance) who performs a Anandha(Happy) Thandavam(Dance). So, I’m named Anand Nataraj. Also I hail from the temple town of Chidambaram where the famous Natarajan temple is located!! Are there any stories or associations attached to it? This is no story behind my naming… I’m just names after the famous Temple & God where I hail from… To be frank my association with dance is just with the name.. I don’t know A.B.C of dance!!! A cobra uncoils from his lower right forearm, and the crescent moon and a skull are on his crest. He dances within an arch of flames. This dance is called the ”Dance of Bliss”, ”aananda taandavam”. The upper left hand contains ”Agni” or fire, which signifies destruction. The opposing concepts in the upper hands show the counterpoise of creation and destruction or the fire of life. The second right hand shows the ”Abhaya” mudra (meaning ”fearlessness”), bestowing protection from both evil and ignorance to those who follow the righteousness of ”dharma”. The second left hand points towards the raised foot which signifies upliftment and liberation. It also points to the left foot with the sign of the elephant which leads the way through the jungle of ignorance. 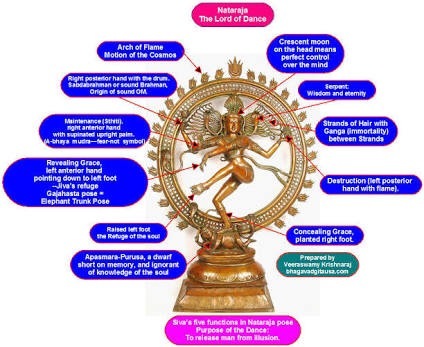 The dwarf on which Nataraja dances is the demon Apasmara, which symbolises Shiva’s victory over ignorance. It also represents the passage of spirit from the divine into material. As the Lord of Dance, Nataraja, Shiva performs the tandava, the dance in which the universe is created, maintained, and dissolved. Shiva’s long, matted tresses, usually piled up in a knot, loosen during the dance and crash into the heavenly bodies, knocking them off course or destroying them utterly. The surrounding flames represent the manifest Universe. The snake swirling around his waist is Kundalini, the Shakti or divine force thought to reside within everything. This also parallels the cords of life worn by the Brahmins to represent the second rebirth. The stoic face of Shiva represents his neutrality, thus being in balance. If you had the choice, would you rename yourself? Definitely not!!! This is the name I’m identified with for this many years and it is something which is chosen by my parents and grand parents. I’d proudly live with this name forever!! Next ›Never been so busy!! !